From left to right: Prof. Tom Dalton, Andrew Cole, Barbara Machado, Simon Finnie, and Michael Diaz. Siobhan Baloochi was not able to attend but is also a team member. begin quoteA USD team of accounting students placed first in the nationwide Deloitte FanTaxtic tax case competition this January at Deloitte University in Dallas. 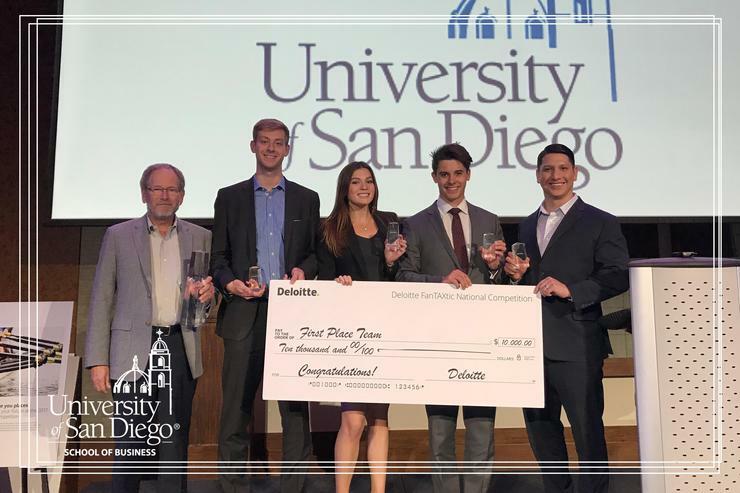 A USD team of accounting students placed first in the nationwide Deloitte FanTaxtic tax case competition this January at Deloitte University in Dallas. Approximately 60 teams from universities across the country competed this year. Teams first compete in one of nine regions during the fall semester. 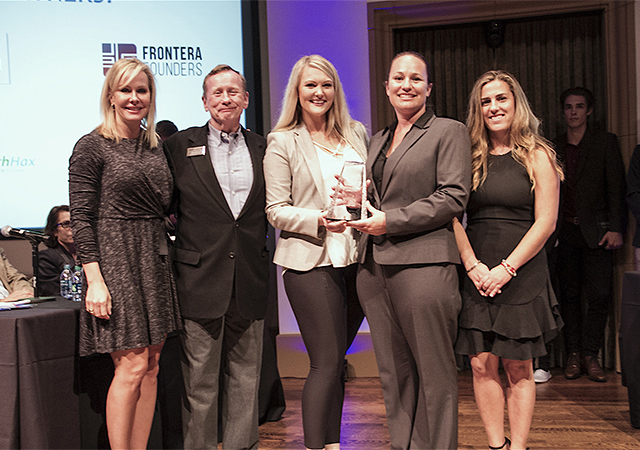 The nine regional first place winners travel to Dallas in January for the final round. This year’s regional winners are College of William and Mary, Syracuse University, Michigan State University, Loyola University Chicago, North Carolina State University, Fordham University, Rutgers University, University of Southern California, and the University of San Diego. In the final round, USD placed first, followed by Loyola University and Michigan State University. This year’s team members are: Siobhan Baloochi, Andrew Cole, Michael Diaz, Simon Finnie, and Barbara Machado. Professor Tom Dalton is the faculty advisor. The annual tax competition is sponsored by the international accounting firm Deloitte as a way to attract talented students to the accounting profession and provide a realistic look at the world of tax consulting. Student teams analyze complicated business situations and prepare recommendations. The recommendations are presented to Deloitte partners who role-play as clients. Teams are evaluated on the quality of their analysis, presentation skill, and ability to answer client questions. 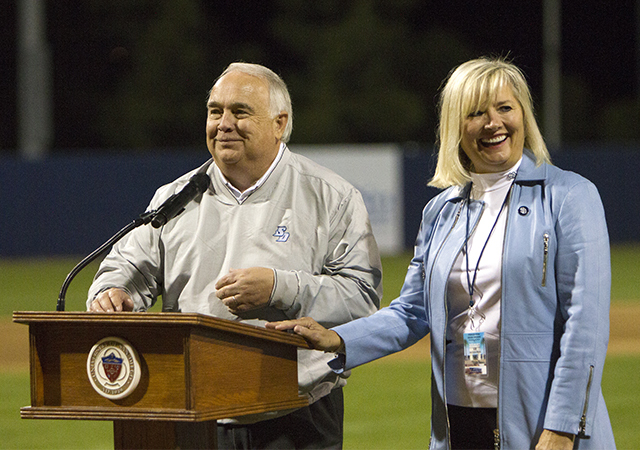 USD has competed in each of the last seven years, finishing first regionally in 2015 and second regionally in 2016. This year’s national competition featured the application of certain modified provisions of the new tax act recently enacted by Congress to a realistic business situation. Students were required to analyze the modified tax provisions under a time constraint and then advise their clients on appropriate tax and business strategies. The judges complemented our USD team on their accurate analysis and their ability to communicate the analysis and recommendations in an effective and professional manner. Students prepared for the competition by studying applicable tax law and practicing presentation skills. Deloitte awarded each student $2,000 and the University of San Diego $10,000 for the first place finish. Read story at Accounting Today.